I remember sitting in my sixth grade math class years and years ago. The teacher had a homemade poster on the wall that proclaimed “PEMDAS!” We wrote a mnemonic in our notes to help us remember which order to perform the operations in our expressions– “Please excuse my dear Aunt Sally.” I don’t remember order of operations being particularly difficult at the time, but years down the road, in my own classroom, it was a different story. Time and time again when the students worked a problem with both multiplication and division in it, they inevitably did the multiplications first and then the divisions, even if the problem required it to be done the other way. The same was true with addition and subtraction. It didn’t matter how many times we said “multiplication and division, work left to right” or any other reminders. It kept happening, and, of course, those tricky test makers made sure to write problems that required a division before a multiplication or a subtraction before an addition. I thought to myself why isn’t this working? Everyone uses PEMDAS. This should work. Well, the point of a mnemonic is to train your brain to remember, right? In the mnemonic, we trained our brain with steps that were laid out in a linear six step process, so that is what the students remembered. If the mnemonic itself has to be modified just to be appropriate, why use it? It didn’t seem to matter if we wrote it so that the M and D and the A and S appeared side by side because every time we said PEMDAS we were putting it all back in a straight line. Eventually I decided that PEMDAS did not work for my students and I wasn’t going to use it anymore. It was actually a kind of big decision; every teacher I knew used PEMDAS. What about when my students went to seventh grade the next year? I decided it was better for them to be able to do order of operations which was the actual skill we were supposed to be doing rather than PEMDAS which is just a mnemonic device, after all. I tried some other mnemonics and they did work! My students no longer got confused, and it actually shortened the number of steps needed to complete the problem! This was great because one of the other issues with successfully simplifying these expressions seemed to be in basic calculation or in writing errors. Less steps, less chances to mess it up! Eventually I have settled on the mnemonic GEMA–grouping symbols, exponential operations, multiplicative operations, additive operations. Why? “Grouping symbols” better reflects new standards that require students to use not only parentheses, but also brackets and other ways to group, such as writing a division as a fraction or using absolute value symbols. Using the term “multiplicative operations” not only reinforces new standards and vocabulary requirements that students be able to differentiate between additive and multiplicative operations, it also brings both multiplication and division into a single step. Students stop thinking about multiplication and division as two separate concepts, but as one concept. Using “additive operations” has the same benefit. Instead of six steps, this is only four steps. The less steps, the less chance there is to make a mistake. It works! My students started making much fewer mistakes and no one was accidentally multiplying before they were supposed to divide. 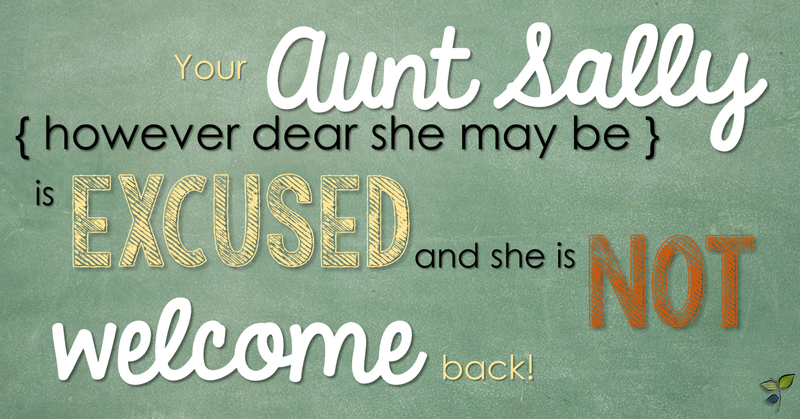 Consider sending “My Dear Aunt Sally” packing. I know I was very glad when she left and have not looked back! I totally agree! My students had so much trouble with this. I love how you mentioned some solutions to the problem as well. Great post! Aunt Sally, if I remember, Loves Raspberries (Left to Right), which kept it straight for me. But, I like the "multiplicative operations" which would emphasize that division is the multiplication of an inverse. You are completely missing the point I’m afraid. BODMAS is absolutely NO better than PEMDAS as it still uses 6 letters for 4 stages of solving and is as open to misunderstanding as PEMDAS is. Very interesting to hear about teaching techniques from around the world! Thank you! BOMDAS with a line drawn under the MD and under the AS to show that these are to be done in the order that they appear worked for me. 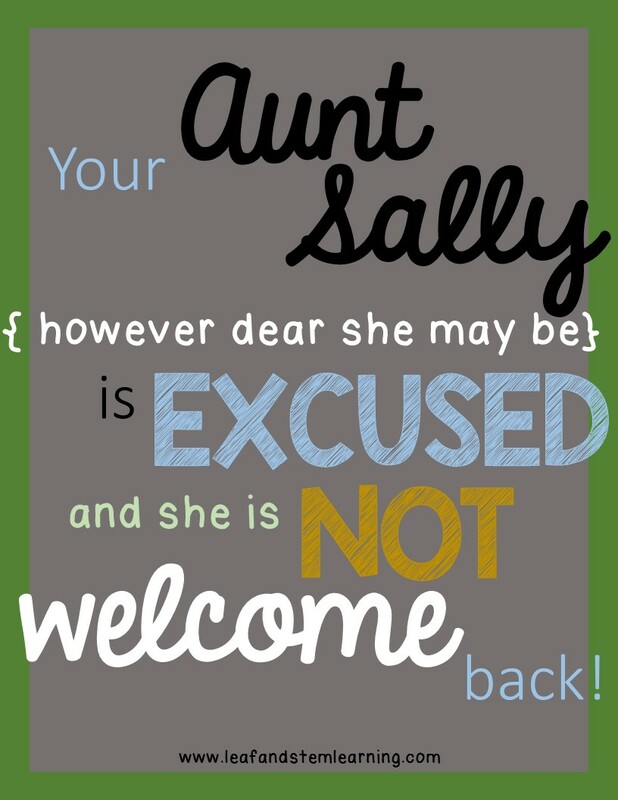 Beware Of My Dear Aunt Sally. And the use of "E" as "exponential operations" will help them when it's time to integrate roots. Roots are the inverse of exponents, so fall in that same position in the order. I gave up on mnemonics long ago. PEDMAS (and all of its variations) and FOIL skirt the actual concepts our students need to learn, they are limited in their scope and they always need scaffolding to fine tune those ambiguities. I teach the structure of the expression to teach the order of operations: grouped operations, within-term operations (exponential operations and multiplicative operations) and between-term operations (additive operations). It turns out to be the same as GEMA, but it informs my students why the operations are ordered the way they are. Reasoning and informing always trump remembering yet another disconnected and meaningless mnemonic. Thank you for your comments. With order of operations, I found in years where I taught no mnemonic at all, the students tended to come up with their own. For example, one year where I did not use a mnemonic, my students came up themselves with PGI–which they called "piggy." To them it stood for parentheses, groups, individuals. That was a younger group of students, so we were not studying exponents. You can see the obvious flaws with "piggy" for when the students reached higher levels of math. This led me to the decision to introduce a mnemonic myself that could move into higher level math with my students. I would only have them one year, the next I knew that they would move to classroom where the teacher probably used PEMDAS. If I gave them GEMA and a strong foundation of the reasoning for order of operations, I could have some assurance that it wouldn't get undone by a future teacher with lots of tricks. Wow what a super great idea!! I will give GEMA a try this year. Thank you for sharing! I don't use any type of mnemonics at all. I teach my students that we simply perform the operations in order of power unless we are explicitly told otherwise (parenthesis/brackets). This means we have to actively have conversations about what types of operations are more powerful. Addition and subtraction are equally powerful as they are the inverse of each other. Multiplication and division are repeated addition and subtraction, so are more powerful. They are also equally powerful, as they are the inverse of each other. Exponentiation is repeated multiplication, so this must be more powerful that simple multiplication, and so on. This forces students to think about what is actually going on with each operation, and make a decision based on 'power ranking'. One issue that makes me sad is the constant mistakes in simple math based on this acronym confusion combined with just bad math. What I’m talking about is the complete inability to understand and handle negative numbers. Things like 4-2+3 making them think it’s 4-5 instead of 4+1. Yes, a better acronym, or even better, scrap acronyms altogether and just teach the order of operations straight up (that’s how I was taught here in Sweden) would be much preferable. In particular combined with the reasoning behind the order so that they understand the logic and necessity of it. I do math for fun and tend to frequent all the math memes around Facebook and it’s horrifying to see just how low the average math understanding is (incorrect answers usually runs in the 60-90% range and never under 50%). One of the most common responses you get for wrong answers is “Because PEMDAS!” (Or BODMAS etc). Next to the acronym confusion comes negative numbers and multiplication by 0, also areas where people have severe problems. Add to that the pet peeve of implied multiplication and incorrect application and misunderstanding of distribution (often because they have no idea how to properly handle parentheses). All in all it’s a minefield of misconceptions and incorrectly understood ideas out there. Wow… Just wow. Ever heard of the commutative property? It really is pretty neat. Of course 5th and 6th graders are learning these concepts at the same time as they begin to learn about order of operations. Fifth graders also do not know yet about the mechanics of negative numbers, as this is not introduced until 6th grade in most curriculums, so the use of the commutative property would not help them deal with the issues created by mnemonics like PEMDAS until they had learned that a subtraction was really just the addition of a negative and that a division was really just the multiplication of a fraction. As this article is written to help educators avoid the pitfalls of teaching using an ineffective mnemonic device (PEMDAS), its emphasis is on the instructional methods that may help teachers in the ages where this concept is introduced. In those grades, students do not yet have the mathematical background (negative numbers and fraction multiplication) to properly navigate the use of the commutative property as a tool for order of operations understanding. This really helped me to understand why my high school algebra classes didn’t prepare me for real-world applications of math!